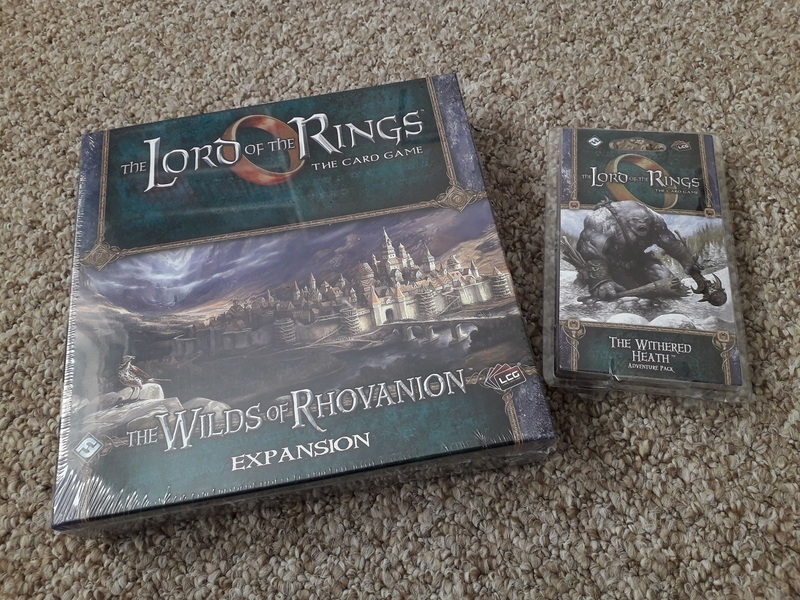 I’m having something of a card game renaissance lately, getting back into both Arkham Horror LCG and my all-time favourite game, Lord of the Rings LCG! 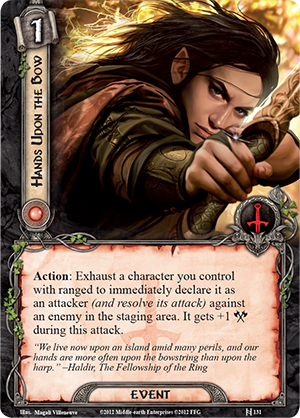 I’ve rambled previously about these events, of course, and today will be a little more of a ramble, as I talk about revisiting three of the absolute classics of the game, the first half of the Shadows of Mirkwood cycle! I’ve waxed lyrical about this game in a number of posts now, but I really can’t quite describe just how much joy I get from playing this game! If you read my original look through the Mirkwood cycle linked above, you’ll know just how much I like to wax lyrical about this cycle. I wrote that back in 2014, but it all pretty much still stands up as true! The cycle is just so classic for me, and so quintessentially what this game is all about. This was released before the Saga expansions of course, when I think FFG didn’t have licence to produce games set to follow the books themselves, so had to work around that by producing these side-stories. We see this most clearly with the Dwarrowdelf cycle, of course, but even with things like the Dead Marshes here, we’re attempting to visit book locations while not telling the story of Frodo and Sam. 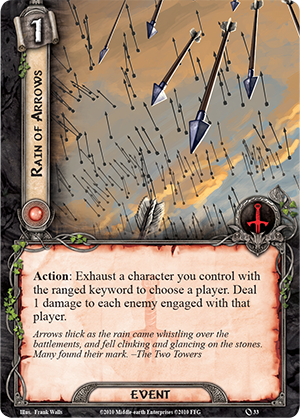 While I’ve been a huge fan of this cycle since I originally bought it, I don’t normally play Conflict at the Carrock or A Journey to Rhosgobel, as I like the cinematic feel of playing packs I, IV, V and VI in that order. Missing out the ‘side quests’ has become so normal for me that actually playing them this time has been a lot of fun! A Journey to Rhosgobel in particular was almost something of a discovery, as I’d forgotten so much of that scenario! I was playing through them with my Elves deck, which is made up of a lot of cards from the Ringmaker cycle, something that I was curious to see whether it would have much of an effect on these comparatively older expansions. As it happens, the answer is no. 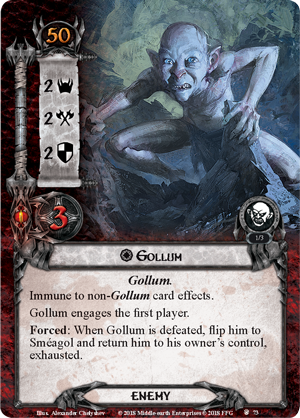 Don’t get me wrong, I think there’s a lot to be said for playing with a much more synergistic deck like all-elves or all-dwarves, as FFG have really made some great attempts to bring these cards together into often quite powerful archetypes, whereas trying to play with the wider synergies of the entire sphere could see you struggle, but I don’t think it makes things particularly easier to manage. 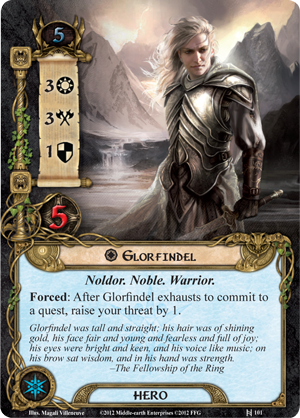 My elven deck can allow Legolas and Glorfindel to become real powerhouses, of course, but I still managed to end up with Glorfindel Sacked! in Conflict at the Carrock, and I did still lose A Journey to Rhosgobel after having only discovered one Athelas plant. I’ve got the second half of these quests to play through as well, of course, but I’m also thinking about playing through on Nightmare mode before I move on to Khazad-dûm. It’s something I definitely don’t normally do, as I find a lot of the time, Nightmare mode feels like it breaks the original theme for the sake of making an otherwise really enjoyable game unnecessarily difficult. 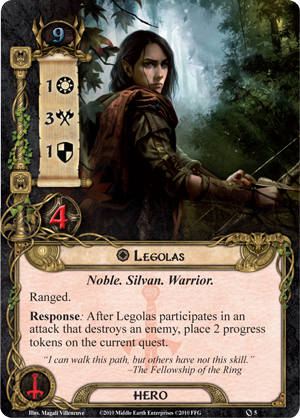 However, when I’ve previously looked through the cards for the Mirkwood Nightmares, I seem to recall they’re actually very thematic as well. Maybe I’m unjustly hating on Nightmare mode? Anyway. We shall see! 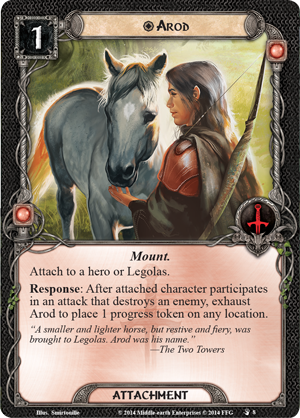 The Lord of the Rings LCG remains my all-time favourite game, and I am really looking forward to getting back into playing through some of my favourite quests, as well as playing the newer scenarios that I have yet to experience! Stay tuned! 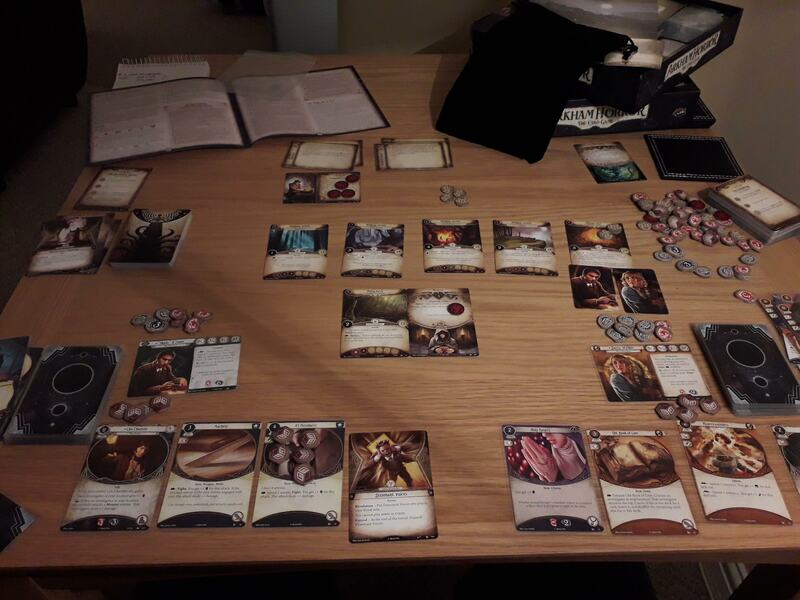 After talking more about the general boardgames in recent weeks, rather than bombarding you all with news of my hobby progress etc, I thought I’d come here and ramble for a bit about how it went with my Arkham Horror LCG core set campaign! It’s been ages since I had originally started this, of course, and I had actually had to re-start so that I could once again get into the game and its various mechanics. So I took Daisy and Skids off on an adventure to save the world from a diabolical cult, and it actually went fairly well – my initial thought about two investigators causing more problems didn’t really pose that much of an issue, as there were also more clues being spawned and we got through the encounter deck a lot quicker, etc. 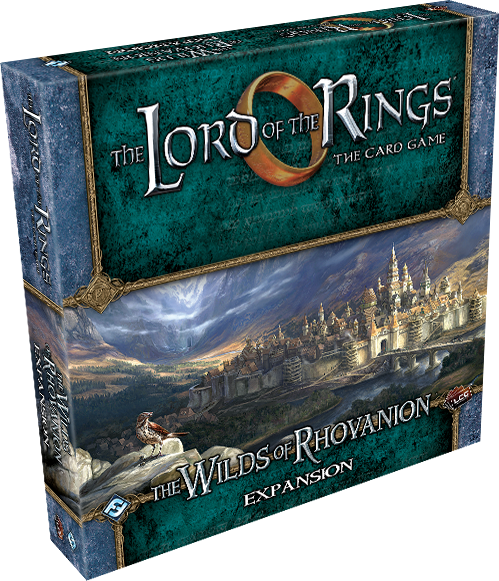 I must say, I’m quite surprised at the differences between this game and Lord of the Rings, which I’d recently gotten back into of course, and my approaches to them. Skids had pretty much been tooled-up to be the heavy hitter, while Daisy was scampering off investigating clues etc, but there is a distinct lack of enemies that require beating up for the Skids deck as I’d been building it to really work. While there are plenty of monsters here, and that’s also true of the board game antecedent also, the game is less about combat than it is about, well, everything else! I quite like that about it, as I’m not really looking for a beat-’em-up style experience all the time. 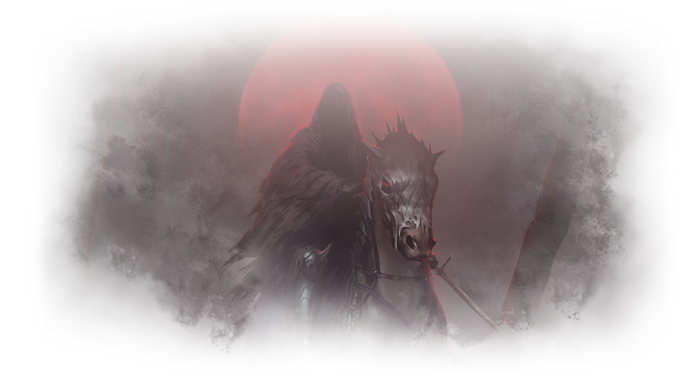 For now, anyway, I’ve made my way through the core set campaign, Night of the Zealot, and while I’m sure at some point I’ll be investing in the campaign box they recently brought out, for now my attention has been firmly fixed on Dunwich. I’ve been putting this off for an age now, of course, but I really want to actually make it to the first cycle of expansions and just see what they’re all about! 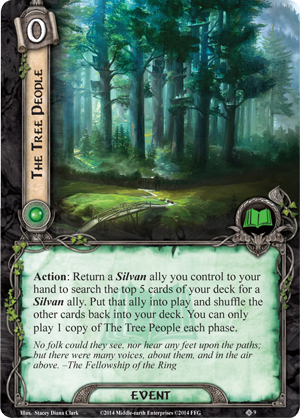 My initial investigations have shown that it has no real link to the core set, so I have retired my Daisy and Skids decks, and instead have been looking to build decks with the new investigators from the deluxe expansion. 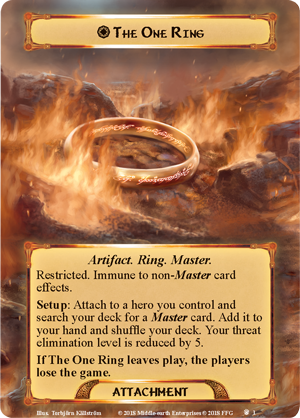 This sort of thing does bring with it an interesting situation, as the investigators here have a completely different sort of limitation upon their deckbuilding, which involves a lot more thought than the core investigators, and just mashing together two factions into a single deck! Of course, I still haven’t made the leap for a second core box, so my deckbuilding options are a little slim as far as that goes, so I’m thinking I may well be buying that second box before Christmas gets here. I’m very much looking forward to getting back into the whole card gaming world of LCGs this autumn/winter season, so stay tuned for more exciting updates!! Author spalanzPosted on October 31, 2018 November 1, 2018 Categories board gamesTags Arkham Horror, Arkham Horror LCG, card games, Fantasy Flight Games, Living Card Games, Lovecraft1 Comment on Getting back to Arkham! 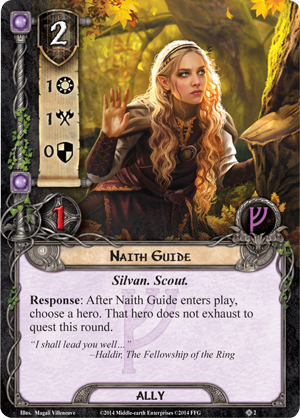 So, after my last blog, I was really feeling the need to get back into Middle Earth, and playing some Lord of the Rings LCG once again. 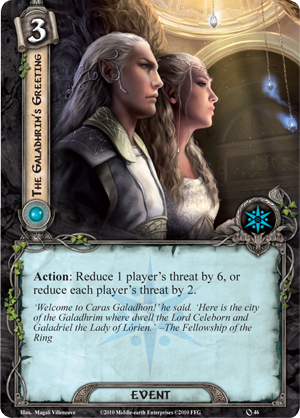 It’s without a doubt my favourite game, so when I had some spare time last Sunday, I dusted off my elves deck and took a turn through the first two scenarios in the core set. My goodness me, what a wonderful time was had! 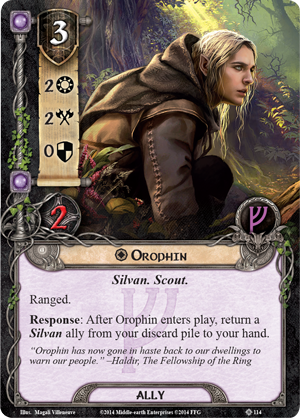 I’d forgotten how good the elves were to play, having not had a game with that deck since 2016, when I had made a brief attempt to get playing this game again, and made a new Dúnedain deck. 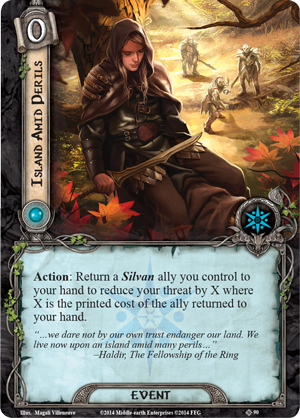 The elven strategy is to gain benefits from discarding cards; some of those benefits can be quite handy, and one of the most notable from my games at the weekend was that of Erestor, allowing me to cycle through my deck a lot more efficiently. I’m sure I’ve said this before, but I feel like I have become a much better card-game-player since I started getting into Magic all those years ago, as the whole Magic scene better-prepares you for building decks etc than any other game I’ve ever come across. While I’m currently thinking that I’m going to try and play my way through the game from the start, cycle by cycle, the reason for me writing this blog today is that I have now taken delivery of both the latest (last?) deluxe expansion, and the first pack in the linked cycle! 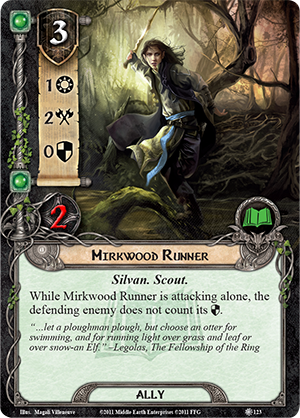 I’ve talked briefly about this before, but I do have the strong feeling that this latest expansion is bringing the game a whole lot closer to the early days of the Mirkwood cycle, when I really fell in love with it and obsessed over it. Of course, I’m not going to get into the whole “is this the final cycle?” question just now. While I did say earlier that I was going to attempt to play my way steadily through all of the released content for the game, I might just have a sneaky game with this expansion at the weekend, perhaps make up a new deck especially for the occasion, and see whether the old magic still pervades the latest offerings for the game. And then I’ll get stuck into The Hunt for Gollum! 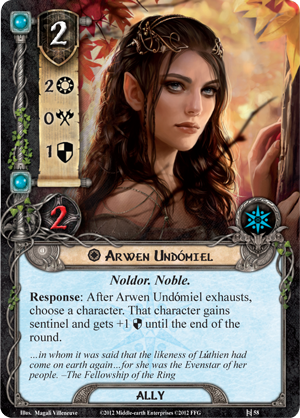 The are, for sure, a number of cards in this deck that I think have been included more for theme than for actual utility – one of those themes being that the art is by Magali Villeneuve… But anyway! 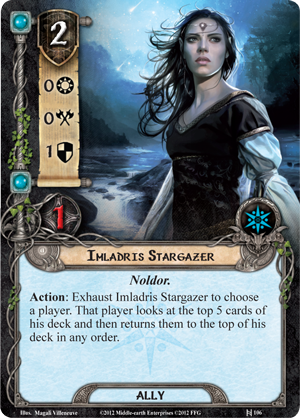 I think it’ll be useful to run through the deck soon and look at some of these cards, such as the very expensive Gildor Inglorion, and replace them with cards that might be better-placed overall. 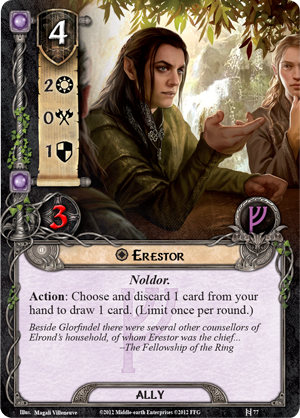 I play Lord of the Rings pretty much exclusively solo with one deck, so all card spaces are at a premium for me. Having cards in there just because the art is nice, or something, is not a good idea. 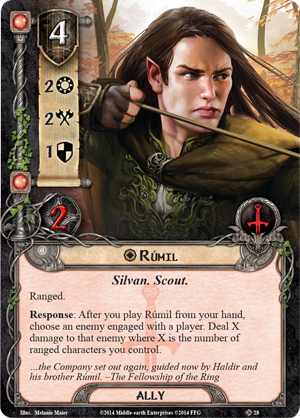 But I don’t want to break the theme too much – it is an elven deck, and I want to have something that works off this theme overall. It feels so good to be back in Middle Earth right now! 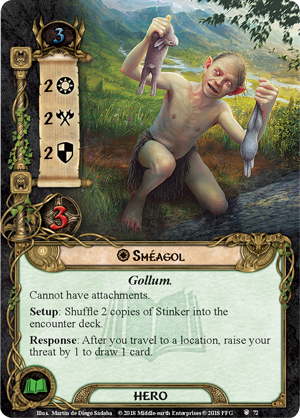 Author spalanzPosted on October 4, 2018 October 5, 2018 Categories board gamesTags card games, Fantasy Flight Games, Living Card Games, Lord of the Rings3 Comments on Returning to Middle Earth! Wow, folks! Just, wow! Things seem to be getting a little bit crazy in the Living Card Game world at the minute, with FFG announcing the end of one of their most successful LCGs, Android Netrunner just days after the announcement of a new co-operative card games, Heroes of Terrinoth! The news that Netrunner is ending is quite the shock, I have to say. I’d always been under the impression that it was one of their biggest product lines, and thought that would be too much to let it go. While the article, Jacking Out, makes it sound very much like the decision was made by FFG, and the game was just at the end of its natural run as a product, there are other quotes scattered around related news articles that refer to “the unfortunate news about the Netrunner license”, which makes it sound more like they’ve lost that license, rather than anything else. A lot has been made in the past of FFG wanting to focus more on their in-house IP, which we’re now seeing with the second-edition-style of Terrinoth games such as the RPG, so I can see why they’re looking at things like the Warhammer license and perhaps choosing not to renew (though what exactly happened there, we don’t know!) Star Wars is doing well for them, and I think A Game of Thrones will continue to be an earner, as well. But it still feels a bit odd that they’re just letting this one go, especially so soon after the rotation period. I’m going to be sad to see Netrunner leave the stable, even though I stopped following the game after rotation. I’ve had a lot of fun with this game over the years, and I still remember the excitement of that very first game I had back in the summer of 2013. When I used to live in my flat, I had neighbours out the back who would hold a massive birthday party around the 4 July weekend every year, which would invariably go on into the small hours – Netrunner proved to be my coping mechanism for that, as I’d just settle down to a night of watching the Naked Gun trilogy, and (initially) sorted out my entire card pool into each faction (up until this point, I’d kept them sorted by expansion). Year after year, that 4 July weekend would be when I’d go through the card pool once again, and see about mixing up my decks for the coming months. It sounds a bit strange, but I came to really enjoy these times, all the same! Netrunner was the game with which I somehow managed to infect my entire local community with the LCG bug, and led to one of only two official tournaments in which I’ve competed. I don’t want to turn this into some kind of eulogy for the game, but I’ll be sad to see it go. 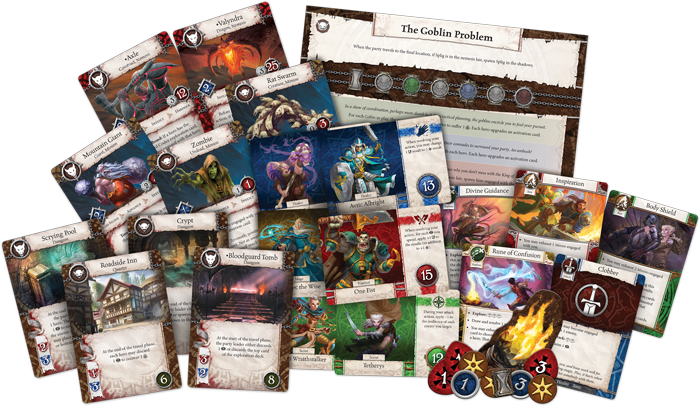 Going back to in-house IP brings us nicely on to the news from earlier in the week, where another co-operative card game has been announced: Heroes of Terrinoth. This game looks like it is strongly influenced by the mechanics of FFG’s Warhammer Quest card game, something that turned out to be a one-shot before the license went away back in 2015. 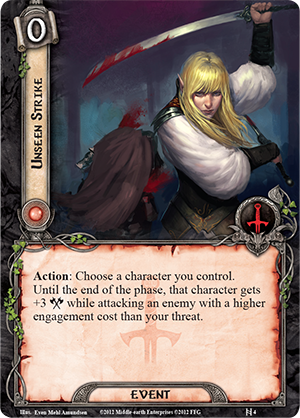 While I wanted to like it, ultimately I wasn’t really a big fan of that iteration, I have to say, which makes me a little wary of saying this, but I’ve been waiting for a Terrinoth LCG for what feels like centuries! It’s definitely got the potential to be a lot of fun, at any rate, something that I think has been the hallmark of the first batch of Terrinoth games such as Descent. 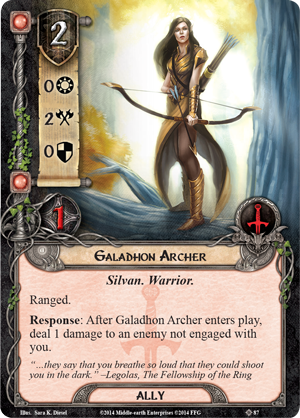 While FFG has looked more at the tribal feel of the setting through factional games like Runewars and Rune Age, I think it’s interesting that they’re returning to the hero-driven style with this new game. It seems to be an aspect that a lot of people appreciate – and I’m guessing that if they had introduced another factional-based game, it would have the potential to be too similar to Legend of the Five Rings. 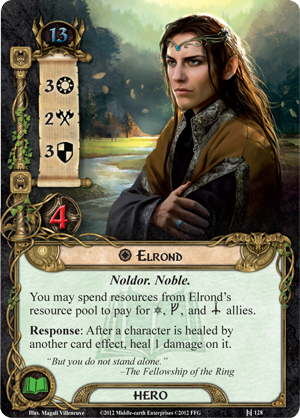 Building a deck as a hero rather than a warlord has that classic RPG feel, which I suppose is another of the hallmarks of Descent-era Terrinoth games. It’ll certainly be interesting to see where this game goes next, and if the tribes such as Uthuk Y’llan or Daqan Lords will make an appearance. It could be telling that the announcement article mentions the setting as Mennara, the entire world of which Terrinoth is only a part, so perhaps we’ll branch out beyond any of the other games FFG has yet produced? 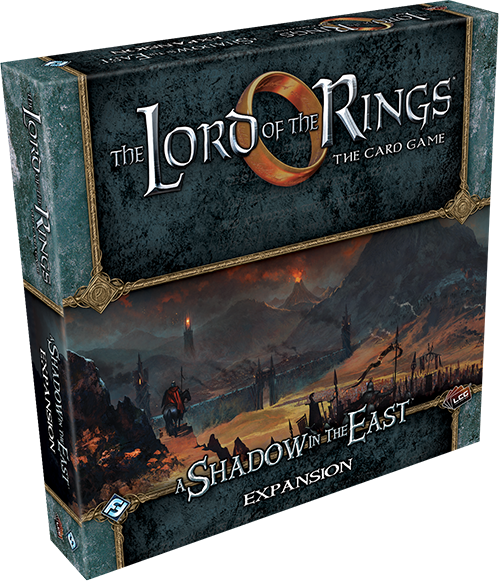 While it isn’t another LCG, I’m guessing that the distribution model will be very much akin to it, with campaign boxes bringing more quests and the like, and potentially class-specific upgrade packs to further kit-out your decks. A huge negative for the Warhammer Quest game was its lack of replayability, but with eight quests off the bat, this should at least be better in that regard. 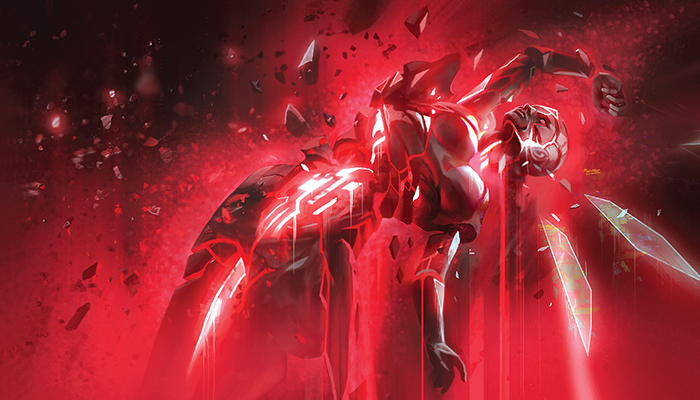 It’s worth pointing out, incidentally, that all mention of the deck-building card game Rune Age has been removed from the products pages now. You can still find it if you search for it, of course, but I wonder if they’re planning to quiety do away with that one now that they have the LCG on the horizon? 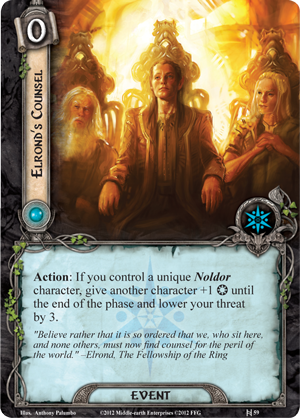 There’s also the State of the LCG article up on the website, which looks into how the Netrunner announcement will potentially affect the other games on the roster. L5R is naturally a big component of this right now, and while I’ve not been paying attention to the latest of the living card games, it does seem like this is perhaps their principal thrust for the time being. The approach of releasing all six packs for a cycle across six weeks, rather than the usual six months, I find really interesting, as it was always something of a contention for the games I used to follow really closely, waiting for that one sweet card that I knew was in pack six, and having to stand by while seeing other factions getting awesome stuff. 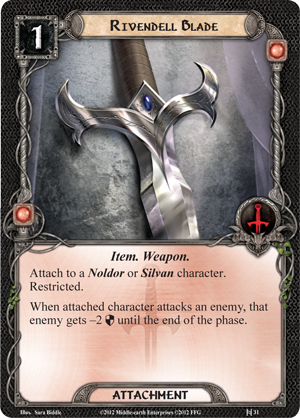 Warhammer Invasion was always a pain for this, but to a lesser extent, I’ve also seen it a lot with Lord of the Rings, when a card would come out in pack six that would have made the experience with quest #3 so much easier! It’s interesting to read how the designers think the other LCGs are doing right now, and seeing their priorities for the future. Arkham Horror and A Game of Thrones also seem to be pretty big for the company right now, and seeing the designer insight for all four of the games here was really interesting as showing just how unique each game is now being encouraged to be. 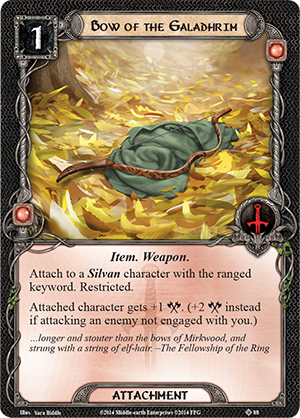 While it strikes me as a little funny that A Game of Thrones seems to be morphing a little into its first edition, it’s cool to see such attention to the story being given in Arkham Horror. 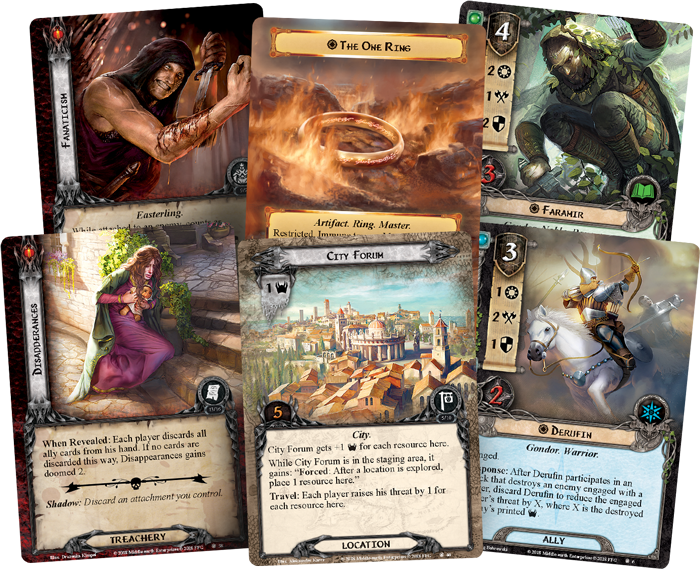 It’s also kinda fascinating to see the differences that each game is trying, with stuff like the Return to the Night of the Zealot box for Arkham Horror that seems to function almost as a Nightmare Deck deluxe, and the intro decks for each House in A Game of Thrones. Lord of the Rings still troubles me a little, though I think there is still the potential there to keep going for a while. 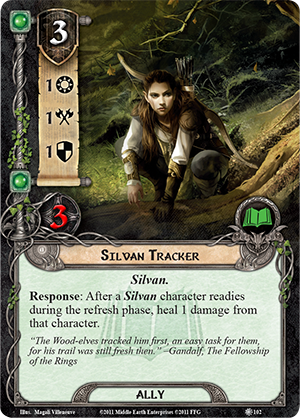 We’re poised on the brink of the Ered Mithrin Cycle, of course, which is exciting as it feels like we’re going back into the heartland of Middle Earth after being away for so long, but there’s a part of me that wonders, will this be the end? I think a lot of players have been guilty for a long time of thinking the end is nigh, but with the launch of the new digital edition, it does seem that this is more of a possibility now. 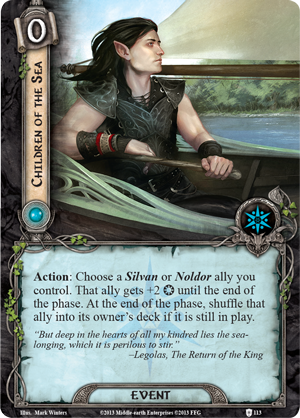 With seven full expansion cycles, not to mention all of the Saga expansions and standalone decks, would this be the right time to draw the game to a close? The glimmer of hope, for me, is seeing Caleb’s thoughts about implementing campaign play with the game now that the main six-part Saga expansion era is over. Not that we should be reading so much into it these days, but perhaps something like a Return to the Night of the Zealot box could be coming, marking a return to some of the older scenarios to make them into a more cohesive campaign. 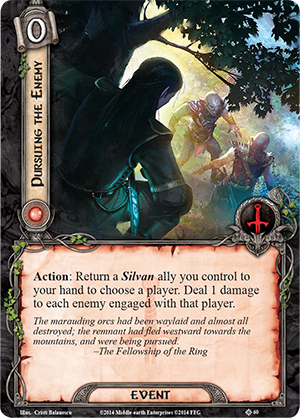 I think it’s really exciting to see them return to some of the encounter sets from the Core Set in the upcoming deluxe expansion, so maybe this could be a thing once again? Anyway, this has been a very long and rambling post about Living Card Games, so I think I’ll stop here. I’m curious to see what other people think, though, so do feel free to leave a comment with your thoughts! 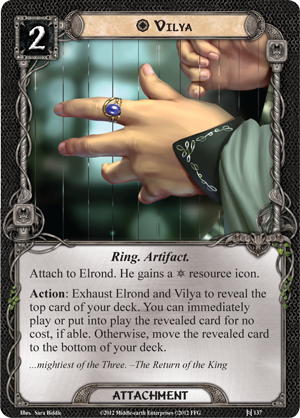 Author spalanzPosted on June 9, 2018 June 9, 2018 Categories board gamesTags A Game of Thrones, Android Netrunner, Arkham Horror LCG, Fantasy Flight Games, Heroes of Terrinoth, LCG, Legend of the Five Rings, Living Card Games, Lord of the Rings, Terrinoth1 Comment on LCG News! 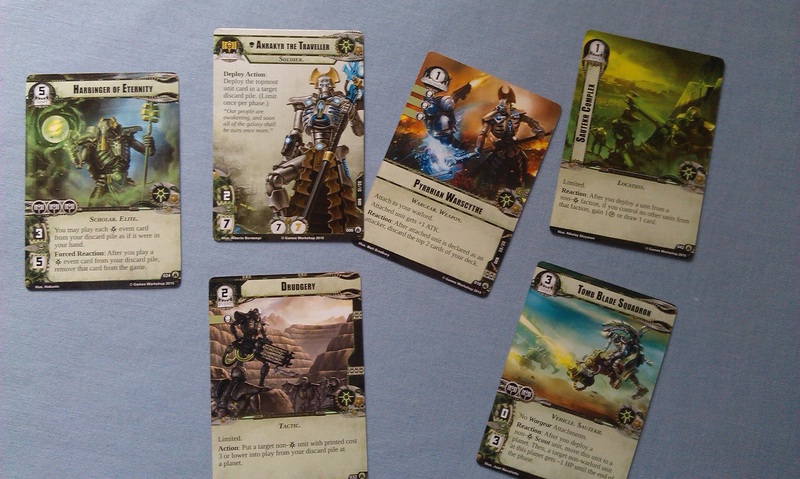 Before I dissolve all of the decks I have set up, however, I wanted to record for posterity here the Necron deck that I built up a year ago when the Necron box first came out, and subsequently tweaked with a couple of the cards from the subsequent Planetfall cycle. It did quite well for me on the couple of trips out I had with it, so I thought it’d be useful to have in case I ever find some fellow hipsters and decide to get back into this down the line! There are ten out-of-faction cards included at the end here because of the subtheme Necrons have, that of enslaving other people (not something in the fluff, but whatever). There are soldier units in there for the Mandragoran Immortals to take advantage of, warriors for the Immortal Vanguard, and scouts for the Tomb Blade Squads. Overall, it was a lot of fun to play the couple of times I got it to the table, though I think it’s quite unfortunate that the game ended with the Necrons such a comparatively under-developed faction. Of course, the enslavement mechanic means you technically have a much bigger card pool than pure-Necron, but even so… it would have been nice to have had another cycle, and see what more we can get out of the pool! I’ve been watching the second international trailer for Rogue One, which does subtly differ from the last official trailer released last month. It’s always cool to see new bits, and I’m certainly feeling pretty excited about this movie right now: I think, more than anything, it just looks fantastic. It has the Classic Trilogy sense of style but with today’s technology making more possible within that setting. Sure, I mentioned this in my musings on the first trailer, where I thought it would make the movie make the original films look shabby in comparison. However, I don’t think that will be the case any longer; maybe I’ve mellowed over the past few months! While the story of the Death Star plans has been done to death in the old canon, I’m actually looking forward to this movie for giving us the definitive story around that. It’s a fascinating part of the Star Wars lore, and while some of the trailer seems to have some bits that look overly cheesy or cliche, I’m still looking forward to what promises to be an overall good film. I’ve pre-ordered the lead-in novel, Catalyst, and I’m really looking forward to getting my hands on it as it’s by one of my favourite Star Wars authors, James Luceno. I’d been thinking I might keep the book to read closer to Christmas, but I might not be able to wait that long, so there may be a review coming in sooner than you think! Speaking of trailers, I’m still super hyped for the upcoming Wonder Woman movie next year! I won’t deny, I was kinda speechless when it first dropped, as it looks like it should be everything we could ever want from such a movie. I still haven’t seen Batman vs Superman, so have nothing to really go on (though by all accounts, her role was somewhat limited in that movie). But these trailers look incredible, and I heartily cannot wait for it! But let’s talk about some games for a minute. I picked up the new Arkham Horror LCG the other day, and it does look kinda fantastic, I have to say. To date, all I’ve done is take the cards out of the airtight bags and quickly ruffle through them, but I’m hoping that, once I’m caught up with my degree, I’ll be able to try it out and see what all the fuss is about. I’ve been subscribed to the page on boardgamegeek since it had one, and have been astonished at the amount of new posts created for it, talking about the minutiae before it even landed. 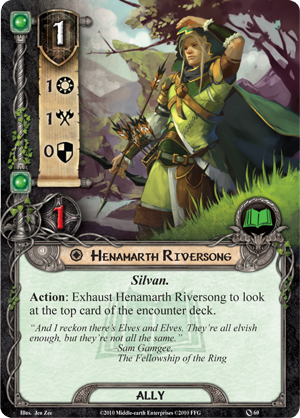 It was akin to the Rise of the Runelords Pathfinder ACG, and I’ve considered unsubscribing because of it! I’m sure it’ll die down in time, however. 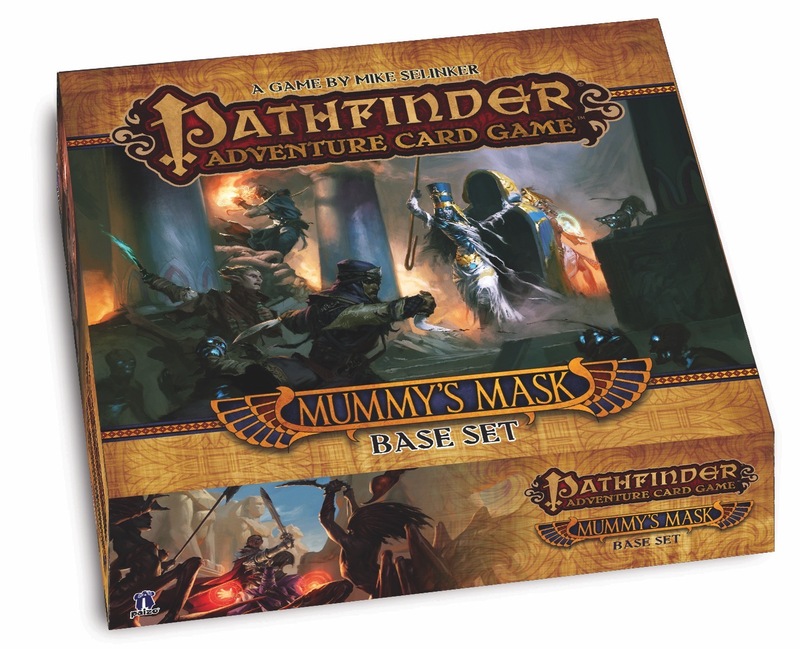 Speaking of the Pathfinder ACG, the fourth box, The Mummy’s Mask, has apparently been released, though I have yet to see it for sale in the UK. Of course, I haven’t really been trying all that hard to find it, but even so! I’ve only recently made it to the end of the first adventure pack in the Rise of the Runelords game, of course, so I’m hardly chomping at the bit for the next box, but it does look amazing! 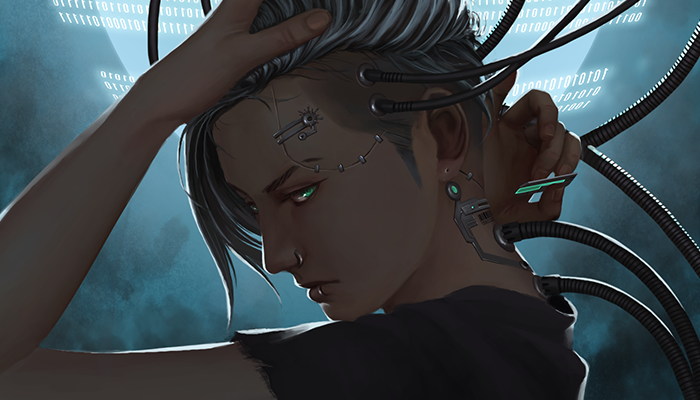 Last night, FFG announced the next expansion for Android: Netrunner, Terminal Directive. The article doesn’t have a great deal of information for how exactly this expansion works, but it looks to be extremely similar to the Pandemic Legacy stuff that involves game components opened and used at specific points of the game/when specific conditions have been met. I’m not surprised that another company has used this idea, because it seems to be doing well for Z-Man Games, though I am surprised that it was used for a living card game rather than a boardgame. 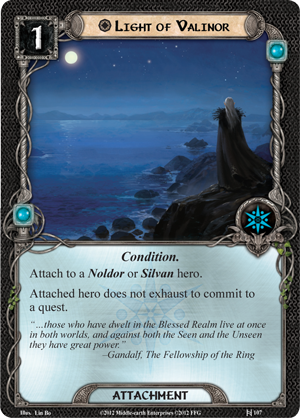 Along with the Arkham LCG, I also picked up the final packs for the latest Lord of the Rings cycle, as well as the final pack for Warhammer Conquest! I do feel kinda sad that the game is over now, but talking about it down at the local store, it sounds like the game isn’t quite dead yet, so I can still try out my Slaanesh demons deck now that we finally have a warlord for the Dark Prince! 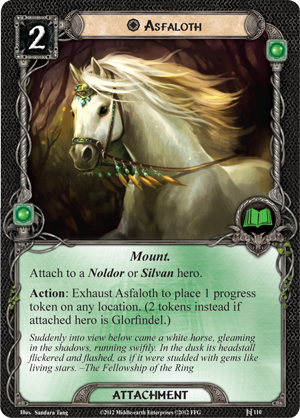 Author spalanzPosted on November 12, 2016 Categories board games, Star WarsTags Android Netrunner, Arkham Horror, Fantasy Flight Games, Living Card Games, Lord of the Rings, new canon, Rogue One, Star Wars, Wonder WomanLeave a comment on Exciting times!